Guiding on every lake in Alabama has its rewards. Especially when you have guided and fished an impoundment on the Warrior river like Demopolis Lake most of your life. I grew up fishing this south Alabama impoundment and I have logged a lot of hours exploring both the Warrior River and Tombigbee rivers, both of which converge about one mile above Demopolis City boat launch. As a teenager we always launched at Lock 5 boat launch near Greensboro. This was about 20 miles from the lakes lower Demopolis dam. A long way to go when you only have a 20 H. P. motor! So it was a while before my fishing actually branched out to newer waters, along this huge river system in south Alabama. Later on in life I learned of Demopolis city boat launch, only one mile downstream from the mouth of the Tombigbee river, where it meets the Warrior river. This opened up a whole new world of fishing and I visited this lower lake region every week in order to learn its hidden backwaters. Just like I already had learned, while fishing “all the way to the dam” near the city of Tuscaloosa, far upstream on the incoming Warrior River. The backwaters of the Tombigbee River featured loads of cypress-filled sloughs, all lined with aquatic weeds and most were full of cooperating bass. The main river itself was a real joy to learn, for every new river bend always featured a new logjam to explore, another main river flat, or a creek mouth nearby and always, some deep water drop-offs to worm in seclusion. That is most of the time, with little or no company. Not like it is today, crowded. Those were the days. Today Demopolis Lake receives a lot of fishing pressure. Not only by the sheer amount of anglers on the lake fishing for bream, catfish and crappie but in addition, a lot of very knowledgeable anglers now targeting Demopolis lake’s spotted bass and largemouth bass as well. Then there’s those bass tournament anglers. 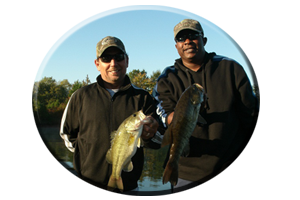 Local bass tournaments are held every week. Major bass tournament trails like Bassmasters have also visited Demopolis lake in recent years. Its now a given fact. These bass are getting ” lure conditioned “. Many of the lakes largemouth bass and spotted bass are fooled each week by at least 100 anglers (or more) and eventually, ” a good 5 bass limit by days end “, is again hauled off to the nearest boat launch. Again, another weekly bass tournament featuring dozens of anglers, has re-located hundreds of bass taken from all over the lake. Soon each and every backwater slough, even small pockets and cuts, or any major feeder creek has been beaten daily by hundreds of bass-seeking anglers. By the end of the spring season a lot of bass have been re-located to places like Demopolis City boat launch, where most major bass tournaments are held. By the beginning of each summer season…re-location has taken its toll in places bass spawned in during the spring season. In addition there are some often very picky, post-spawn bass returning to their summer homes. Sometimes, with a seasonal change such as from spring to summer, you have many variables that can actually re-locate a lot of the lakes bass population. Variables of all kinds can suddenly put these bass on the move. Places you actually, ” tore em’ up in ” this past spring can almost be void of bass on your next trip, due to sudden changes in things like water clarity. Heavy evening thundershowers (that can quickly muddy up creek backwaters), can send bass towards creek mouths or the nearest place featuring clearer water. Or the complete opposite can occur, clear water from little or no rain can make for some tough, summertime fishing. 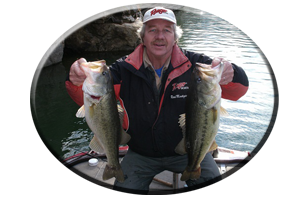 Warming waters can send bass looking for cooler waters, aquatic weed growth has the oxygen and cover, and big bass may be very selective or which weeds they occupy. When you see hot, 90 plus degree air temperatures (or worse yet over 100 degrees), you again get re-location. This time by the bass themselves. 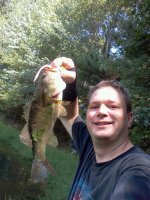 Maybe to cooler, deeper water (or like some humans there are loners), you will catch some bass that just cruise the shallows. Or maybe even a big bass or two, those rare bass that may bury up in some very thick weeds or wood cover, until fooled by some astute angler. An angler that holds its fate in his hands. So as you can see practicing “catch and release” does help keep those big bass in certain locations, for you, or some other angler to again experience that thrill of fooling and fighting a big bass some other day! So is there hope? Its hard to say. After all, summer is a very tough time of year for most anglers. Coupled with 100 degree days and today’s constant fishing pressure, its getting harder and harder to fool a good bag of bass by the days end. But there are suggestions! Summer is a good time to explore deep water on the main lake or go searching for bass far up some major feeder creek. The majority of Demopolis Lake’s schooling bass will be in deep water. This can be due to the ever increasing hot days of summer, coupled with bright, bluebird skies. Or low oxygen content in the shallows can send bass deep. So looking at the conditions such as the weather, the lake level, how much available current is present on each outing and especially finding places with less ” fishing pressure ” helps avoid the hordes of anglers, and it keeps you one step ahead of those anglers that do not do their homework prior to their planned fishing trip to Demopolis lake. When I first started fishing Demopolis Lake, it had more cover. Along the main river were stump rows, lay down trees and washed in debris, like logjams and brush. Today constant barge traffic, flooded waters and even dredging the mouths of cuts and creeks has removed a lot of the wood cover. Many creek mouths and the small entrances to hidden backwater sloughs are now silted in from these constant variables. Some places you cannot even enter during drought or low water conditions. The mouths of creeks, small pockets and cuts or other refuges, are still good today and they do hold schools of summertime bass, that can move up on any day. So exploring several of these types of spots all in a days time, can eventually put you on a school of cooperating bass. You could be on a spot that did not even produce a bite when you fished it earlier in the day! Having a dozen of these types of main river spots can keep you moving all day and it also helps you cool off, while running and gunning from spot to spot! Deep outside river bends, feature immediate drop-offs right into deep, main river channels and ledges. They always have rocks, ledges and washed in debris like logs and trees. These are places where schools of bass can congregate during the summer months for weeks at a time, due to certain conditions or the availability of food. Islands and main lake points are places baitfish seek shelter out of the swift, current on the main lake. Rock bluffs have first and secondary ledges and often places where the banks have broken off and huge boulders have tumbled down into deep water. 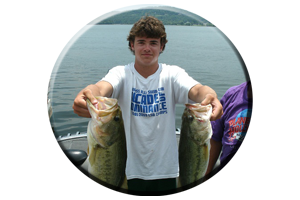 Perfect places for both spotted bass and largemouth bass to call home during the entire summer season. Lures for tackling these bass are many. During summer a bass will hit any lure in the box. That is, if you are fishing it in the right place. So think deep during the summer months if fishing on the main lake near deep water. But always have a few lures rigged and ready, like topwaters, jerkbaits and shallow to mid running crankbaits. Schooling bass can erupt at any time and these lures are always good for these frantically feeding bass, hidden just under these shad schools in mid depth waters. * Deep Diving Crankbaits – the deeper they go the better. Fish these lures on as light a line as possible. Some pros go as small as 6-8 pound test line to get deep divers to go their deepest. Sharp hooks are a must. * Worms of all sizes – try finesse worms on small 1/8 ounce to 1/4 ounce jig heads. Or Texas rig a big 8-12 inch worm or try a big lizard for those big bass bites in deep water. 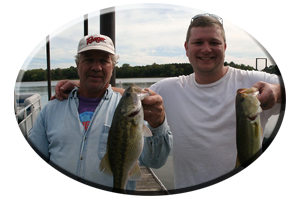 * Jig Combos – such as the now popular football head style jig are tailor made for Demopolis deep, summertime bass. Try various jig colors, different weights and try all types of added trailers to determine the days preference. * Jigging Spoons – A forgotten art among most anglers, but they still fool bass! 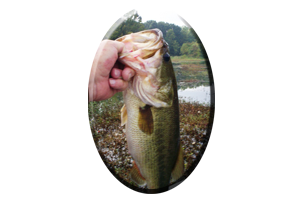 Especially summertime bass feeding on or near bottom, those bass that are looking for an easy to catch, fluttering and dying-looking meal. Always use heavy line in the 15-20 pound test. The heavier the spoon, the heavier the line. * Spinnerbaits – These are great deep water tools if you use them right! Always have a 1/2 ounce to one ounce spinnerbait tied on, preferably a single bladed model. A single, large willow leaf blade or a single, Colorado blade will put out more flash and vibration for deep water bass to more easily locate. * NOTE * Trailer hooks for short strikers, and no trailer plastic lures to slow the lures fall, are suggested. * Rattling Lipless Lures – Just like a spinnerbait you can reel these lures fast just under the surface of the water, or you can fish them in mid depths with a slow roll retrieve. Or allow them to flutter to the lakes bottom and slowly retrieve them with a lift and drop presentation. Try 1/2 ounce models fished along shallow to deep drops and always have a big 3/4 to one ounce lipless lure tied on (like a Bill Lewis Rattletrap or Cordell Rattling Spot), for deeper fish.